Leagues: Lewis TWO PA#1s! SBL, Dansbury combine for 8 golds! Pennsbury girls sweep ALL track events! Like we've seen so many times before, Cheltenham were excellent on the day once again, as they continue to look like the machine that shows no signs of slowing down. The girls made it look easy, scoring a whopping 239 points. Chanel Brissett recorded 100 and 200 meter victories, with an 11.91 100 meter prelim time and a 24.36 200 meter dash prelim time. Alexis Crosby and Nicole Burke finished 1-2 in the 400 meter dash with times of 56.40 and 56.70 respectively. Ciara Leonard swept the hurdles with a 13.92 100 meter hurdle time and a 44.24 300 meter hurdle time. They even recorded a 1-2-3 sweep in the long jump and the 3200 meter run. The boys had points to make up after losing their dual meet to Wissahickon during the cold weeks of March. They turned up the heat on the weekend, with John Lewis running PA#1 marks in the 300 meter hurdles (37.77) and the 400 meter dash (47.92) and earning a win in the 800 (1:55.14) and the 4x400 meter relay (3:19.15). Christian Brissett ran 10.60 in the 100 meter prelims and reclaimed his state lead in the 200 meter dash with a prelim time of 21.43. Saahir Bethea won the high jump (5-10), jumped a PA#2 in the long jump (23-7.75) and won the triple jump (44-3). But despite all that effort, Wissahickon became league champions for the 2nd year in a row, only losing to Cheltenham by 2.5 points to retain the title against the state meet favorites. Other highlights include 9th grader Taylor O'Brein of Plymouth Whitemarsh running 2:17.25 to win the girls 800 meter run. Kieran Moore of Upper Dublin won the shot put (53-9.50) and the discus (146-11). At William Tennent, Pennsbury girls completed the rare feat of winning every single running event on the track. Dasia Pressley won the 100 (12.00) and the 200 (24.39 prelims), Uche Onuoha won both hurdles, setting a meet record in the 300 meter hurdles (43.07). Olivia Sargent set a meet record in the 1600 (4:54.15) while leading Pennsbury to the first seven places in the race! She also won the 800 in 2:18.09. Shannon Taub swept the long jump and triple jump with marks of 17-7.50 and 36-5.50. The boys meet had much more parity, but Pennsbury were still the best team on the day. The Pennsbury 4x8 ran 7:49.39 to just miss the meet record by .06 seconds. Alex Sauer won the 1600 (4:21.94) and 800 meter runs (1:55.69). Kornelius Klah won the high hurdles (14.66), while Sam Webb won the 3200 meter run (9:33.85). Dave Marrington of Neshaminy won the intermediate hurdles in 38.31 to hold off Klah's 38.99, but was unable to hold off Isaiah Smith of Abington in the 400 meter dash, with Smith running 49.40 to Marrington's 49.64. D'Andre Pollard of Neshaminy won the long jump (21-9) and the triple jump (44-8.25). Jake Brophy of CB East stayed hot after his sub 9 minute performance last week in the 3200. He won the 3200 again on Saturday with a winning time of 9:28.57 and he showed off his speed with an 800 meter victory in 1:55.62. He was also a member of their victorious 4x800 meter relay that ran 7:51.15. Casey Comber of Hatboro Horsham set a new meet record and PA#2 4:14.20 to win the 1600 meter run. The girls, North Penn brought home 4x800 (9:17.63) and 4x400 meter relay gold (3:57.18). Marissa Sheva and Taylor Chapman of Pennridge won two gold medals a piece. Chapman won the 100 (12.22) and 200 meter dashes (25.27), while Sheva won the 3200 (10:51.98) and 1600 meter runs (4:56.39). Maddie Villalba of CB West ran a meet record 2:12.21 to win the 800 meter run. Grace Becker of CB East cleared 5-7 to win the high jump, the best mark of the week in the event. Allison Williams of North Penn jumped a meet record 37-8 to win the triple jump. Arguably the deadliest 1-2 punch in the state of PA were unstoppable on Saturday. Sierra Brabham-Lawrence and Ty'Asia Dansbury of Harrisburg combined to win a massive 8 gold medals. Dansbury won the 100 (12.06), the 200 (PA#1 24.21), the 400 (PA#2 55.76), and ran on Harrisburg's 3:52.07 4x400 meter relay. Brabham-Lawrence was also on that relay team and she took gold in the high hurdles (13.89), the intermediate hurdles (43.84) and the triple jump (38-2.75). Outside of that show, Mady Clahane of Cumberland Valley took home the 1600 (5:01.49) and 3200 meter runs (10:41.82). Susquehanna Township ran 47.34 to win the 4x100 meter relay. Palmyra ran 9:27.54 to win the 4x800 meter relay. Lilly Harnish of Waynesboro cleared 5-6 to win the high jump. Tesia Kempski of Bishop McDevitt cleared 12 feet to win the pole vault. Dazjanuque Williams of Cedar Cliff jumped 19-0.50 to win the long jump. For the boys, Peter Hughey of James Buchanan ran 48.78 to win the 400 meter dash. Zach Brehm of Carlisle won the 1600 (4:17.86) and 800 meter runs (1:54.78). Sean Weidner of Lower Dauphin ran 9:33.79 to win the 3200 meter run. Charles Bowman, Jr of Central Dauphin East ran 14.43 to win the high hurdles and 38.71 to win the intermediate hurdles. He was also on their 42.46 4x1 and their 3:20.25 4x4. Isa Paschall of Carlisle now tops the state in the long jump with a mark of 23-9.25, while teammate and triple jump state leader Deshawn Millington jumped 47-4 to win his main event. Paul Power of Spring Ford ran a new state leading time of 4:13.35 to win the 1600 meter run over PA#3 Dylan Eddinger of Boyertown (4:14.71). Eddinger did run 1:55.78 to hold off Power in the 800 meter run, while Power ran 9:41 for 3200 meter gold. For the girls, Caroline Duffy of Methacton won the 300 meter hurdles (44.81), the 400 (56.99) and 200 meter dashes. Allison Brunton of Owen J Roberts ran 2:15.87 to win the 800 meter run. She was also on the 4x800 meter relay team that ran 9:31.88 for victory. Nicolette Serratore of Methacton won the triple jump (37-4) and the javelin (124-1). Micah Sims led Haverford School to their first team title since 1976 with the team MVP award for the 2nd year in a row after wins in the 100 and 200 meter dashes. Sam Ritz of Germantown Academy ran 1:54.25 to win the 800 meter run. Billy McDevitt of Malvern Prep won the 1600 and 3200 meter runs. For the girls, Mikayla Schneider of Notre Dame won the 400 meter dash in 56.59 and ran 2:17 for 800 meter gold. Abbie Goldstein won the 3200 and 1600 meter runs (5:04.73). Brooklynn Broadwater started her day with a high hurdles win in 15.05, but suffered a pulled hamstring in the 100 meter dash to cut her day short. Cyre Virgo's state high jump winning streak of over 3 years came to an end thanks to Gabriellea Johnson of Governor Mifflin clearing 5-6 to win the high jump. Virgo did win the long jump with a mark of 17-7. Jocelen Ruth of Kutztown Area won the shot put (40-7), the discus (136-11) and the javelin (144-8) to win the throwing triple once again. Anne Den Otter of Wilson (3) ran 5:02.71 to win the 1600 meter run, while teammate Amina Chtourou ran 2:14.89 to win the 800 meter run. The Wilson 4x8 ran 9:28.28 to earn victory as well. For the boys, Wyomissing Area ran 7:56.10 to win the 4x800 meter relay. Reading ran 3:21.61 to win the 4x400 meter relay. Joey Mundell of Schuylkill Valley threw a PA#2 59 feet event to win the shot put and 167-9 to win the discus. Jahvel Hemphill of Bloomsburg ran a lifetime best 10.64 to hold off the 10.74 performance from Brian Zimmerman of Mifflinburg in the 100 meter dash. Despite defeat, Zimmerman won the 200 (21.75) and 400 meter dashes (49.32). Luke Rarig of Southern Columbia won the high hurdles (14.37) and the intermediate hurdles (38.57). Qayyim Ali of Williamsport cleared 6-6 to win the high jump. Garrett Nork of Williamsport threw 157-3 to win the discus. For the girls, Jenna Farmer of Lewisburg won the 1600 (5:10.24) and 800 meter runs (2:17.83). Courtney McCartney of Selinsgrove is back to her back, throwing 47-11 to win the shot put and 132-2 to win the discus. Lindsey Carl of Central Columbia cleared 5-6 to win the high jump. Maura Fiamoncini of Mount Carmel threw 146-3 to win the javelin. GeZoriea Amos of Williamsport ran a blazing 24.89 to win the 200 meter dash. Sophomore Madison Wiltrout of Connellsville became the new national record holder in the girls javelin with a throw of 185-8 on Thursday at her WPIAL AAA Central Section Qualifier! It breaks the previous record of 181-2 set back in 2012! The video of her historic throw is below! A feature with quotes from the record holder herself can be found HERE! Dominic Peretta of Beaver Falls continues to win, winning the 1600 and 800 meter runs. Griffin Mackey of Sewickley Academy ran 9:35.73 to win the 3200 meter run. Trevor Adams of Freedom (7) threw 53-10 to win the shot put. Dom Westbay of Shenango threw 159-1 to win the discus. For the girls, Marianne Abdalah of Vincentian Academy won the 1600 and 3200 meter runs, breaking 11 minutes for the 4th time in a row. Lizzie Weimer of Burrell threw 41-5 to win the shot put. Ameriah Walters of Valley ran 43.85 to win the 300 meter hurdles. The field events were on fire at this regional meet, as Robbie Wolak of South Park threw 53-7.50 to win the shot put. Jesse Roamnchak of South Side and Alex Burns of New Brighton both jumped 45-1.50 in the triple jump. For the girls, Joryn Jozwiakowski of Fort Cherry jumped 37-10.50 to win the triple jump. Hanna Pitchford of Serra Catholic threw 40-4.50 to win the shot put. Sarah Stanley of Sputh Park threw 129-11 to win the javelin. Madeleine Davison of North Allegheny looked sharp in her 1600 meter race, running 4:53.29 to win the event and she added an 11:09.11 3200 meter win. Kat Quigley of Pine-Richland continues to be one of the top hurdlers in the district, running 14.98 in the high hurdles and 44.16 in the intermediate hurdles. For the boys, Ori Rinaman of Mars Area continues to be unstoppable, running 14.33 in the high hurdles and 39.18 to win the intermediate hurdles. Elias Graca of Fox Chapel continues to get back to his indoor form, running 1:53.78 to win the 800 meter run. Jordan Geist of Knoch threw 63-10 to win the shot put and 169-3 to win the discus. Andrew Manz of North Allegheny threw 193-4 to win the javelin. Kelsey Potts of Mount lebanon ran 5:14.30 to win the 1600 meter run, while her teammates ran 9:40.95 to win the 4x800 meter relay. Claire Dougherty was also on that relay, and she ran 2:15.10 to win the open 800 meter run. For the boys, Lyle Banton of Upper St Clair ran 39.32 to win the intermediate hurdles. Lilly Harnish of Waynesboro jumped 37-9.50 to win the girls triple jump. Erica Helm of Greencastle-Antrim cleared 5-4 to win the high jump. For the boys, Christopher Payne of Waynesboro cleared 13-3 to win the boys pole vault. Michael Biddle of Williamsburg won the boys javelin by 53 feet with a winning throw of 209 feet. He has four of the top ten javelin throws in the state this season. Austin Krise of West Branch jumped 47-8 to win the triple jump. For the girls, Selena Damiano of Bellwood Antis threw 37-10 to win the shot put. Nicole Leonzo of Harrisburg Christian won the 100 (13.03) and 200 meter dashes (25.94). Kierra Zach of Northern won the 1600 (5:12.27) and 3200 meter run (12:03.73). Teammate Kennedy Shank of Northern cleared 11-3 to win the pole vault. For the boys, Keith Steele of Northern cleared 14-9 to win the pole vault. Andrew Snyder of Camp Hill won the 400 (51.89) and 200 meter dashes (23.23). Kia Clayton of Saltsburg won the girls long jump (16-8) and the triple jump (37-7.50). For the boys, James Scott of Northern Cambria threw 161-10 to win the javelin. On Day 1, Kaiyaan McDowell of George Washington cleared 6-5 to win the boys high jump. The girls field events were highlighted by a 1-2-3 sweep by Girls High in the long jump, with Sierra Nesmith jumping 17-6.50 to win the event! On Day 2, Markeeta Thomas of Paul Robeson won the high hurdles (14.50) and the intermediate hurdles (43.22). Nia Sherrod of Overbrook ran 57.90 to win the 400 meter dash. For the boys, Julian Degroot-Lutzner of Masterman won the 1600 (4:30.48) and 800 meter runs (1:57.44). Ade Roundtree of Imhotep won the 100 (10.93) while Damere Gilbert of Boys Latin Charter ran 22.14 to win the 200 meter dash. 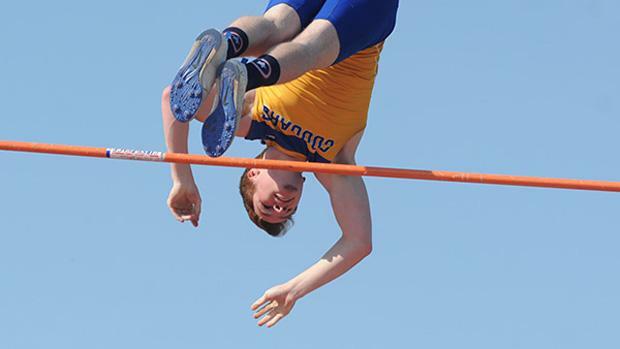 Ryan Wilkes of Valley View equaled the PA all-time best mark in the pole vault with a clearance of 16-6! The mark ties Joe Berry of Hatboro Horsham (2007) and Chris Williams of Strath Haven (2012). It also sits at US#13 for 2015! Pat Monahan of North Pocono also had a big day, taking over the state lead in the 100 meter dash with a meet record time of 10.73. He also ran a meet record 21.97 to win the 200 meter dash. Hunter Watkins of Elk Lake won the javelin with a mark of 195-7. Keyron Harbin of Scranton jumped 45-5 to set a meet record in the triple jump and win by 3 inches. Matt Kravitz of North Pocono won the 1600 (4:19.74) and 800 meter runs (1:58.15). For the girls, Cassidy Jenkins of Lakeland swept both hurdle events, winning the high hurdles in 14.55 (meet record 14.47 prelims) and the intermediate hurdles in a meet record 44.38. Lucianne Burner of North Pocono cleared 12-3 to move up to PA#3 in the pole vault. Brooke Estadt of Lakeland jumped a meet record 37-11.50 to win the triple jump. Mackenzie Greenfield of Holy Cross ran 5:14.11 to win the 1600 meter run and 2:21.44 to win the 800. Erin Feeney of Scranton Prep ran a PA#6 meet record 10:46.98 to win the 3200 meter run. On Day 1 in the Colonial League, Lindsay Bauer of Salisbury jumped 18-5.50 to win the long jump and ran 46.29 to win the 300 meter hurdles. Her teammate Kaitlin Toman jumped 11-6 to win the pole vault. The boys had Shavaughn Morris of Bangor clear 6-4.50 to win the high jump. In the newly formed Eastern PA Conference, Khyasia Caldwell-Adams of Pocono Mountain East jumped 18-10 to win the long jump. The boys had Colin Abert (9:41.59) and Kevin Lapsansky (9:42.50) finished 1-2 in the 3200 for Easton. Freddie Simmons of Bethlehem Catholic ran 39.73 to win the 300 meter hurdles. On day 2, Colin Abert of Easton became the new state leader in the 1600 meter run with an EPC conference winning time of 4:14.56! Khai Samuels of Pleasant Valley ran 1:57.37 to win the 800 meter run. Freddie Simmons of Bethlehem Catholic won the high hurdles (14.92) and the intermediate hurdles (39.73). For EPC girls, Jaylyn Aminu of Liberty won the 100 (12.24) and 200 meter dashes (25.54). Mahendra McWhite of Dieruff ran 14.41 to win the 100 meter hurdles and 43.98 to win the 300 meter hurdles. Greer Gumbrecht of Easton cleared 11-10 to win the pole vault. In Day 2 of the Colonial League, Angelina Biondo of Pen Argyl won the 1600 (5:17.70) and 3200 meter runs (11:03.29). Lindsay Bauer of Salisbury added to her long jump win with a 300 meter hurdles win (46.29) and the triple jump (36-11.50). For the boys, Joe Espinal of Wilson (11) ran 1:55.94 to win the 800 meter run and 4:19.39 to win the 1600 meter run. Drew Hess of Wilson (11) threw 187 feet to win the javelin. The girls 1600 meter run was by far the deepest event at the Ches-Mont championship meet, with 8 girls breaking 5:15. Aislinn Devlin of Downingtown West followed up her big 3200 meter win on Friday by emerging as the victory in this tussle, running 5:00.29 to edge out the Unionville trio of Anna Juul, Kacie Breeding, and Cami Rickenbach. McKenna Keegan of Avon Grove competed for the 1st time in open events since her big 2:08 performance on April 17 and she won the 400 (56.29) and 800 meter runs (2:13.29). West Chester Henderson ran 9:37.83 to win the 4x800 meter relay. Evelyn Berecz of Downingtown East jumped 37-6.50 to win the triple jump. For the boys, Eric Diestelow of West Chester East was at his best today, taking home the 1600 (4:20.77) and 3200 meter runs (9:38.97). 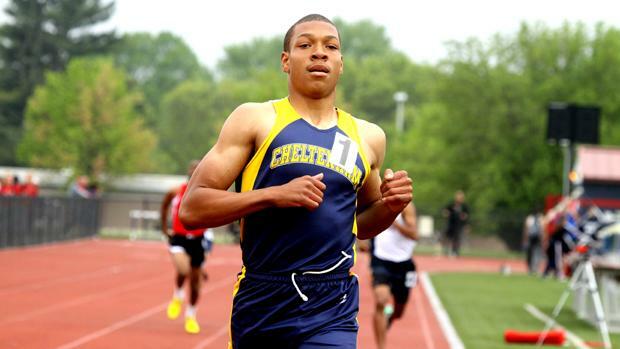 Dan Chisena of Downingtown East ran a blazing 21.68 to take the state lead in the 200 meter dash! Coatesville's Jay Stocker jumped 45-7.75 to win the triple jump. Karli Visconto of Nazareth Academy won the 1600 (5:14.32) and 800 meter runs (2:19.33). Gywnedd Mercy Academy ran a meet record 48.88 to win the 4x100 meter relay and 9:38.98 to win the 4x800 meter relay. Erin Sample of Nazareth Academy threw 39-6 to win the shot put. Erin Zimmerman of Villa Maria Academy threw 127-6 to win the javelin. Brooke Cope of Jim Thorpe threw 128-5 to win the javelin. McKayla Lally of Pine Grove ran 45.87 to win the 300 meter hurdles and 59.80 to win the 400 meter dash. For the boys, James Close of Pottsville won the 100 (11.32) and 200 meter dashes (23.05). Andrew Marston of Conestoga put himself in the top three of the boys 1600 meter run with his victorious performance of 4:16.43. Evan Emanuel of Penncrest runs 1:54.56 to win the 800 meter run. Donovan St Louis of Upper Darby ran 49.26 to win the 400 meter dash, while teammate Mason Weh ran 14.95 to win the 110 meter hurdles. Upper Darby ran 3:19.73 to win the 4x400 meter relay. Evan Sing of Penncrest threw 192 feet to win the javelin. For the girls, Maura Henderson of Harriton followed up her Henderson 1600 meter win a Central League Champs win with a time of 5:07.18. Nina Gambacorta of Garnet Valley threw 39-10 to win the shot put. Penncrest ran 48.78 to win the 4x100 meter relay and 4:01.04 to win the 4x400 meter relay.